EastWest FREE SM Movie Cards ~ Philippine Freebies, Promos, Contests and MORE! Here's a treat that will surely be enjoyed by movie buffs out there. 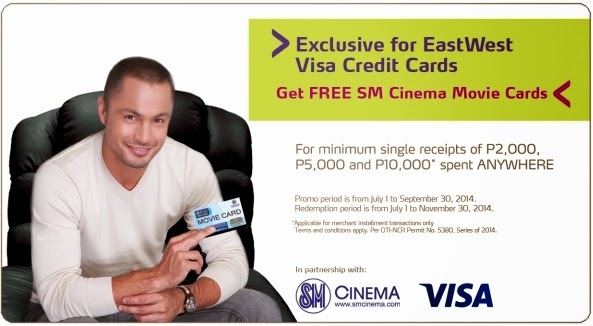 FREE SM Movie Cards are up for grabs whenever you use your EastWest card. Shop at least P2,000 and be entitled to 1 SM Movie Card. A P5,000 purchase slip is equivalent to 2 SM Movie Cards. Lastly, 4 SM Movie Cards are available for charge slip worth P10,000. Each Movie Card is worth P100. Present your credit card and your transaction slip at any participating SM Cinema ticket counters nationwide. Be sure to write your name and credit card details at the back portion of your charge slip. A little note for merchant installment transactions which do not meet the P10,000 minimum single-receipt purchase requirement: You are still eligible for the movie card treats provided that the P2,000 or P5,000 purchase requirement is met. Enjoy redeeming up to a maximum of three (3) FREE SM Cinema Movie cards per card, per day.